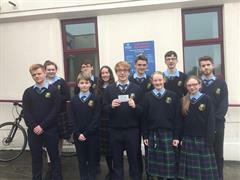 We here in Maynooth Post Primary and Maynooth Community College, incorporating Coláiste Pobail Mhá Nuad, take great pride in our school uniform and we expect all our students to be in full school uniform at all times. Thank you for supporting us in our implementation of the school shoe policy last year. We will continue to monitor this in the coming year. In light of, this we are attaching samples of school shoes which are acceptable and samples which are not acceptable. If you have any queries in relation to this, please contact the school. From September 2017, it will be compulsory for all students to wear our new Jacket. In conjunction with the PTA and the uniform subcommittee we have sourced a new school jacket taking feedback from parents and students into consideration. The new jacket is waterproof, will fit easily in lockers and will have the student’s initials on the sleeve of the jacket. This is the only jacket which will be accepted as part of our school uniform. *Please note that tracksuit bottoms, leggings, jeans, boots, runners or trainers are not allowed as part of the school uniform. It is advisable to name tag all items of uniform. If a student arrives to school out of uniform, home will be contacted and a parent/guardian will be requested to collect their son/daughter from school or provide the require uniform. We thank you in advance for your support and cooperation with this matter.